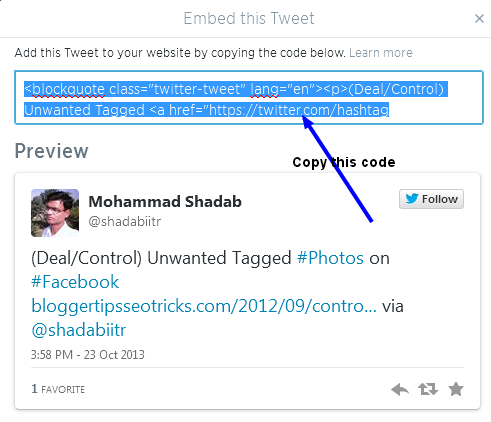 Description: Officially Embed any Tweet in your Blogger blogs post. You can also show tweets in your Blogger sidebars. Do you want to embed Twitter tweets in your blog? Here is a simple guide to do it simply. Twitter is also a best place like other social media sites to drive traffic to your blog. The more re-tweets your post has, the more traffic you'll get. Twitter had changed their site look recently, and now Twitter has officially allowed you to embed any tweets into your blog. Just you have to paste some piece of code, provided by twitter, to where you want to show the embedded tweets. 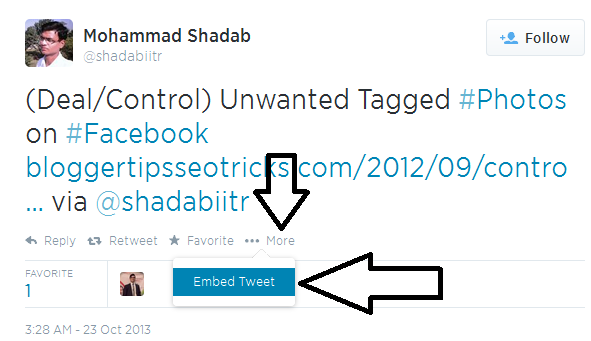 If you are using embed tweet box in your blog, it has so many features listed below. If you are new to my blog, you should also read how can you show your Blogger post featured image, title, description and author information to Twitter via Twitter summary card meta tags when someone tweet your post. Now, take a live preview of embed tweet inside my blog posts that you may re-tweet, favorite it directly via this embedded tweet. You are followed by your visitors directly via the embed tweet. They can reply to you. Your visitors can add your tweets in their favorite list. Go to your Twitter account or someone else twitters account, and goes to the tweets page. According to the above preview, click on "Embed Tweet" under "....More". Just copy the code, and paste on Blogger. Create any new post or go to the edit mode of any of your post, then click on "HTML", make sure you are not in "Compose" mode in your Blogger post editor. Now, paste the copied code anywhere in your post editor where you want to display it. Similar, you can use this code anywhere on the web where HTML allowed. Therefore, you may also use this code into your WordPress blog, just keep in mind that you have to choose "HTML" mode into your post editor. Now, what should be the next? Do you want to embed documents file such as PDF, DOC or XLS into your Blogs? Here is a simple solution. Read how to embed PDF, Microsoft Word .doc or Microsoft Excel .xls file to blog: included responsive embed code. You can also use Twitter marketing to grow your business.